If you've had your eye on a new graphics card for the new year, today's the day to take the plunge. 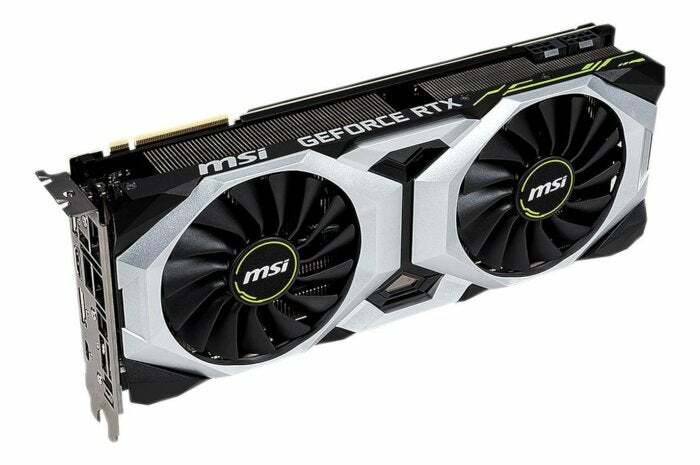 Newegg is selling the MSI GeForce RTX 2080 Ventus 8G for $633Remove non-product link after applying the checkout code SPVGAJANTEN and a sending in a $15 mail-in rebate. And to sweeten the pot, Nvidia is throwing in a copy of Anthem and Battlefield V, the first game with ray tracing support, for free. The RTX 2080 is a fantastic card for just about anything you can throw at it right now all the way up to 4K at 60 frames per second. The great part about the RTX 2080, however, is not so much how it performs now but what it will be able to do in the future. Nvidia’s RTX cards support ray tracing and AI-enhanced Deep Learning Super-Sampling (DLSS) for hyper-realistic visuals and gameplay. The only real drawback is that there aren’t many games that support these new technologies just yet. But you'll be able to try out ray tracing for free with the bundled Battlefield V, and you can pick up a copy of Final Fantasy XV to give DLSS a whirl. (Check out our full list of games that support the new Nvidia technologies for others.) Otherwise, you can use the RTX 2080 to bask in the glory of awesome 4K gameplay, or ridiculously maxed out 1080p gaming if that’s your bag. Even if you forget to mail in the rebate like we often do, you're still only paying $648 upfront, more than $70 cheaper than the MSRP of $720 and one of the best prices we've seen.